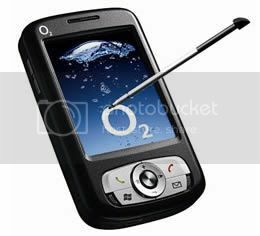 O2 Xda Atom Exec pocket PC features an Intel XScale PXA 27x 520MHz processor, 192MB of flash ROM, 64MB SDRAM and an additional miniSD memory card slot to expanded storage. The Xda Atom Exec also includes a 2.7-inch TFT QVGA LCD, 2 megapixel CMOS camera with mirror, white LED strobe flash and FM radio. The handset which supports MIDI, MP3, WAV, WMA and AMR file formats can connect to various devices via built-in wireless LAN, infrared IrDA, Bluetooth, Integrated GSM/GPRS, high-speed EDGE phone, stereo audio jack and mini USB connector. The O2 Xda Atom Exec weighs just 140 grams with the dimensions of 58 x 102 x 18.5 mm. Price and availability is expected to be announced sometime in the near future.